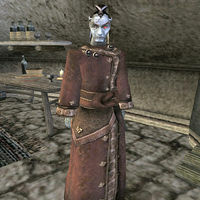 Uvele Berendas is a Dunmer priest who will take up residence at Indarys Manor after the stronghold is built (he cannot be found before that). If you are a member of House Redoran, he will offer you potions, spells, and spellmaking services (you must be of rank Oathman or higher, but this is guaranteed if you have risen high enough to have built your stronghold). If you are a member of House Hlaalu or House Telvanni, however, he will attack you instead (unless you have taken advantage of the loophole that makes you a member of both Houses Redoran and Hlaalu).